Hematoxylin Eosin staining of glioma in the mouse. 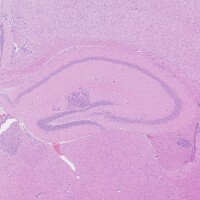 Metastases is detected in the area close to the dentate gyrus of the hippocampus. 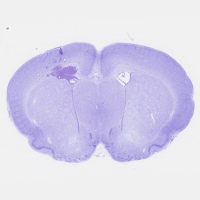 Cresyl violet staining in rat brain for characterize gliomas. 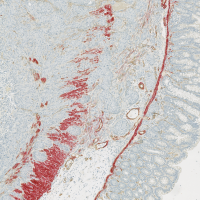 Development of a method of image analysis for characterizing angiogenesis within tumours (α-SMA in red and CD31 in brown). 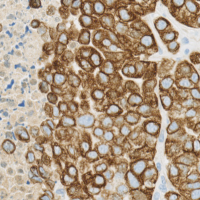 Determination of the HER-2 status of paraffin embedded xenograft tumours by immunohistochemistry of HER-2 (can also be performed with in situ hybridization). The epithelial growth factor receptor (EGFR) is particularly over expressed in several tumour pathologies (breast tumours, carcinoma, etc.). When it is bound to the epidermal growth factor (EGF), it is partly responsible for cell division. It is therefore a signalling pathway very much exploited in the research for novel therapies. 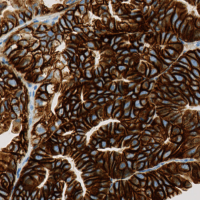 We have developed an application for image analysis which aims to quantify the expression of phospho-EGFR. In this video, we show you how to quantify this receptor in a xenograft model and measure its expression level. One can thus obtain indications regarding the efficacy of the treatment tested.